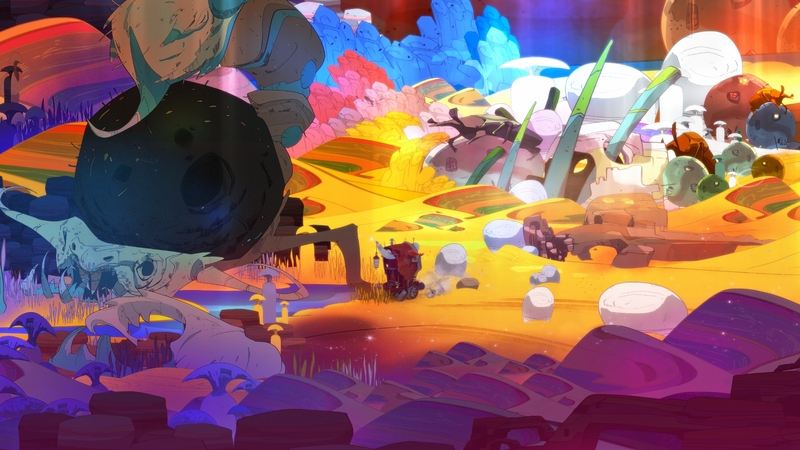 Adventure stories sprinkled with apocalyptic hope, enveloped in beautiful art and music with an innovative gameplay element...a recipe that Supergiant Games is known for cooking, and its third game Pyre is no exception. Don’t get me wrong, this is a fantastic thing; the threading together of a mystical land and friendships, intriguing characters of uncertain destinies, and betrayals is certainly a welcome boon in our day and age. Pyre delivers this along with its innovative gameplay ideas farther than some may feel comfortable, but that others will welcome with open arms. 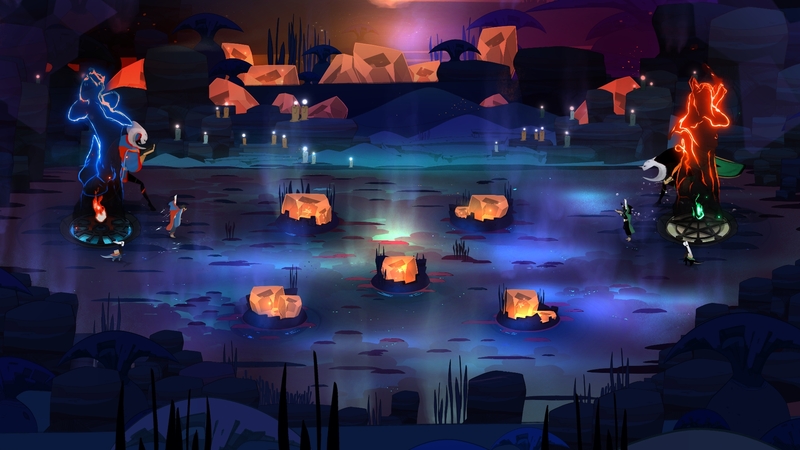 In Pyre you play an unnamed outcast exiled to the Downside, a desolate and dangerous land inhabited by others who have at some point defied the Commonwealth, the empire almost everyone calls home. A band of exiles rescue you from death’s door, and quickly after realizing that you are a Reader (an activity banned by the Commonwealth), they rope you into their plans to find freedom from the Downside. As you learn from reading a mystical tome simply called the Book, gaining freedom involves a ritualistic series of Rites performed by the different factions who inhabit the Downside. Rites are conducted in an arena-style fashion, with three players on each team working together to bring a celestial orb (the ball) into the other team’s Pyre (goal). It’s essentially magical basketball, and as the Reader you orchestrate (i.e. play as) your three team members to reign triumphant in the Rite. The faction who is the most successful in the Rites has the chance to offer one of their members up to regain their status in the Commonwealth, essentially gaining their freedom. When playing the Rites, each team member has their own unique ability along with various stat assignments: Hope (amount of time it takes to respawn), Glory (amount of damage done to a Pyre), Presence (size of aura), and Quickness (....duh). Players are also allowed one Talisman, which can boost abilities or stats and can also be upgraded over the course of the game. Each player has varying abilities; some can jump or fly, while others can spawn minions or shields. 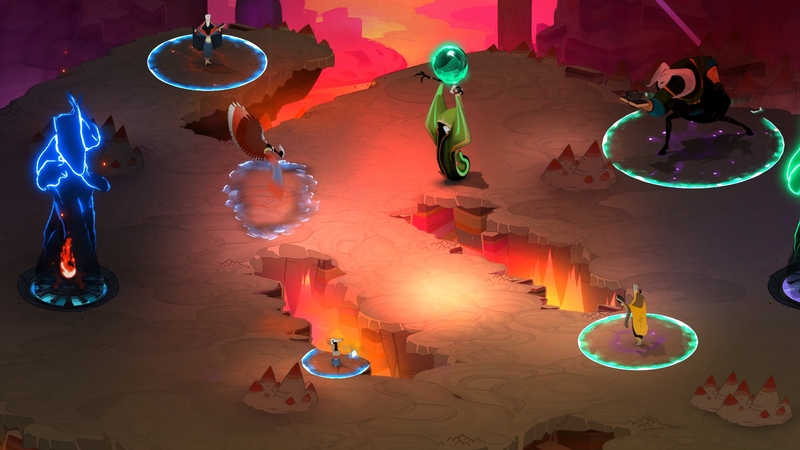 Auras surround each player, which when touched by an opposing team member, banish them from the arena for a period of time. Over time as the Rites rise in difficulty, it becomes quite interesting to deepen your understanding of different strategies and play styles. Titans can also be invoked before each Rite, increasing the difficulty in exchange for higher experience. Outside of the Rites, gameplay takes place in Oregon Trail-style fashion via traversing the lands, collecting resources, shopping, but most importantly getting to know your fellow exiles. The Blackwagon, your mobile abode, is where most of the action happens and where you collect all kinds of trinkets and artifacts from your travels. Along with magically housing your comrades, the Blackwagon acts as your home base where you can look at your team members’ items and profiles, change the music, and do other fun interactive things. From time to time you can also be summoned by the Beyonder Crystal, which allows you to practice against fake teams or run through individual trials to gain items. 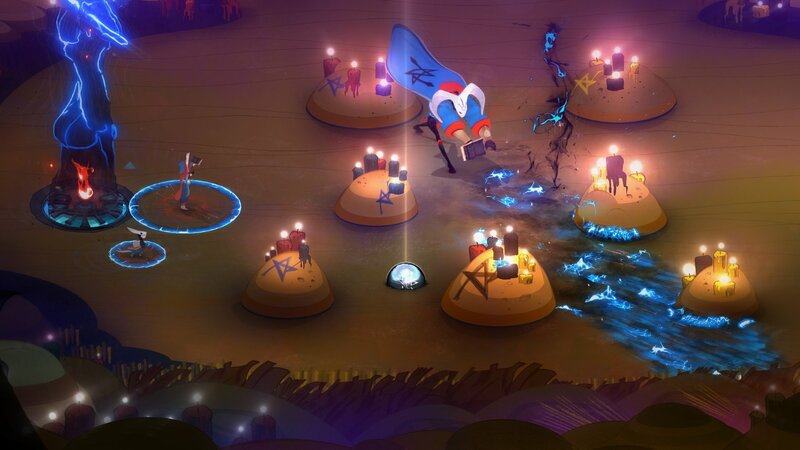 Pyre is initially a fairly linear game with the Rites taking place sequentially, but about a third of the way through it opens itself up to a bit more choice between who you battle and which plots you end up progressing. It turns out that many your comrades have unresolved issues, and completing the Rites in a certain order seems to move some of these along, even if you lose. The beautiful thing about Pyre is there is no game over -- you can continually succeed or fail and the plot will continue along accordingly. As a small break from the Rites, when traveling across the lands you often come across choices in your path which affect what bonuses or resources you gain. For example you have the option to partake in Vocations from time to time where you can choose to individually train your team members to gain individual enlightenment (XP), gather resources to sell, or read up on the Book to boost team stats. Sometimes one of your comrades will spot an opportunity for bonuses or items to aid you in your journey. There’s no right or wrong here which is a relaxing respite from the pressure of the Rites. 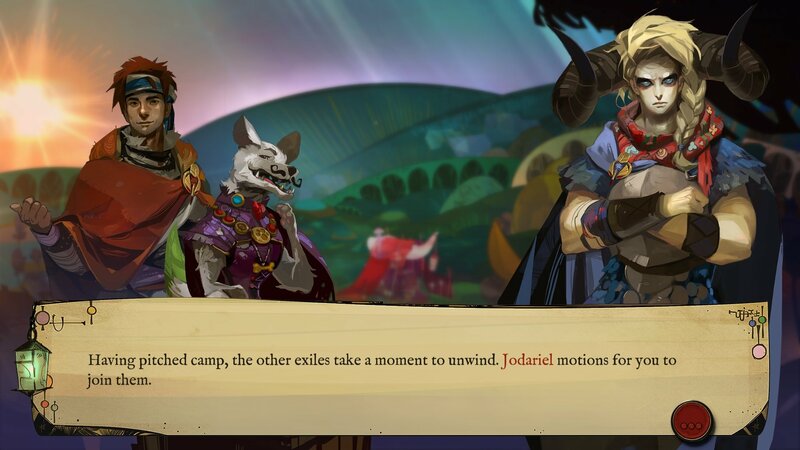 With the exception of the Voice who acts as a narrator and announcer for the Rites, Pyre focuses on text-based storytelling. You, for the most part, are a silent agent in the story but there are a few moments where there’s a chance to respond or offer an opinion, which can affect the various characters’ stats but not much else. One of the most unique features in the dialogue is an in-game reference dictionary where you can mouse over a name, place, or significant item and it will highlight the definition and meaning for you so you don’t lose context. The Book is also an excellent story reference point, detailing much of the lore and history of the world as you uncover new ground. The Downside itself, despite its name, is like a bright and colorful death metal storybook set in a fantasy world of bog creatures, tree people, harpies, and other fantastical folk. The interior of the Blackwagon contains beautiful hand-painted interactive environments where you can click on various things and get a reaction -- for example, blowing out candles or rousing a strange creature, or activating various trinkets and artifacts in the room that provide different lighting or sounds. 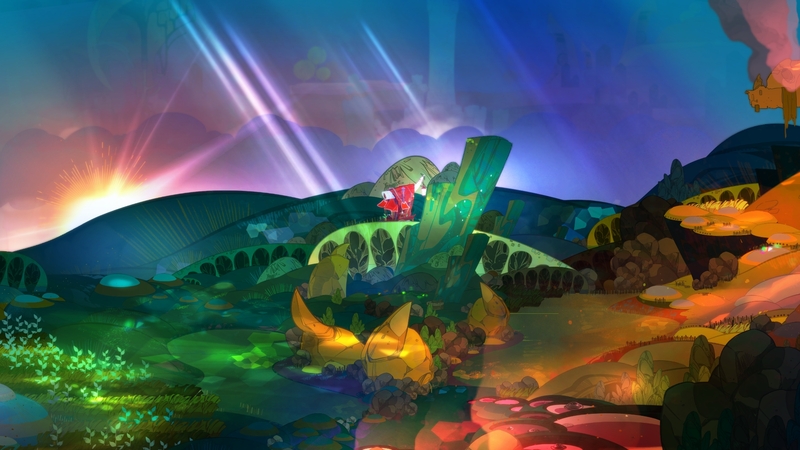 The sound design is, as to be expected from a Supergiant game, quite amazing, evoking a strong sense of adventure and whimsy during the journey. The gameplay within the Rites is a fairly new concept to absorb, which took some time to get used to, but once I did I found that I really enjoyed it. Everything for the most part is balanced and fair, although there were a few hiccups here and there. For example, getting the orb into the Pyre can be tricky at times as there’s a small window for error and a lot of precision required for “dunking,” so to speak. Also, when there’s a lot of action happening at once, most notably when picking up the orb, there’s a momentary lag that occurs which can be detrimental (I lost a few rounds due to this). Despite some of these hiccups, it’s difficult not to enjoy being part of this strange world and participating blindly in its customs. Although I wasn’t quite as attached to the characters as I had hoped, I did appreciate the medley of personalities and felt the world and its customs were admirably orchestrated within everyone’s backstory. It might not be for everyone, but Pyre delivers on its fun gameplay in a way that beautifully illustrates the struggles of redemption and what it means to gain true freedom.